The Aegean Islands are a group of Greek territories that lie in the Aegean Sea mostly off the Turkish coast and include Lesbos, the largest of the group and the third largest Greek island, Thassos, Samos, Chios, Ikaria, Lemnos and Samothrace as well as some smaller islands. Getting around the Aegean Islands by ferry is relatively simple. There are numerous services connecting the mainland with the various Aegean islands and there are also a large number of inter island crossings offered too. If you need to reach Greece prior to onward travel to the Aegean Islands then there are plenty of ferry companies offering services from Italy which is itself well connected by land and sea with the rest of Europe. 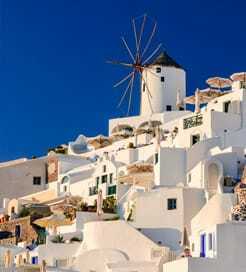 Less-visited than either the Cyclades or the Dodecanese, the Aegean Islands as a consequence retain more character. Lesbos has been a resort since Roman times and offers a lot of variety from the port and capital of Mytilene to quiet mountain villages, as well as busy resorts and forests. Outside Mytilene, check out Ayiassos, a lovely hill town with cobbled streets and a 12th century church. Molyvos on the north coast has a picture postcard port and a fine castle, while the resort of Samos is perhaps the loveliest of the group with great beaches, mountainous terrain and forests making for great walking. It also has a number of important archaeological sites. Limnos has one of the largest natural harbours in the Aegean, good beaches and one or two historical sites, while Samothrace has good night life at Kamariotissa and, beyond it in the hills is the pretty village of Hora with the remains of a fort and beautiful views of the sea. Thassos has a striking hilltop Byzantine monastery, an outstanding archaeological museum and an ancient Greek temple at Alyki as well as great beaches. For more information, please visit our Ferries from Dodecanese Islands to Aegean Islands page. For more information, please visit our Ferries from Turkey to Aegean Islands page. For more information, please visit our Ferries from Greece to Aegean Islands page. For more information, please visit our Ferries from Athens to Aegean Islands page. For more information, please visit our Ferries from Cyclades Islands to Aegean Islands page. For more information, please visit our Ferries from Lesbos to Aegean Islands page.